New home sales spike happened in March as developers marketed more projects after the Lunar New Year holidays in February. The 15-days of Lunar New Year celebrations typically augurs in slower sales. The data released by the Urban Redevelopment Authority (URA) showed that the new home sales spike happened after developers sold 1,054 units last month, more than double the 455 in February. URA’s statistics showed that new home prices decreased for a second straight quarter in the three months ended March 31 after the government added cooling measures in July, helping to buoy demand. CBRE believes the the new home sales spike clearly shows that demand for mass market projects remain driven by quantum. “Mass market projects dominated the 10 new launches in March, led by two major projects Treasure at Tampines (289 units sold, 59.0% take-up) and Florence Residences (77 units sold, 38.5% take-up). Palatable price quantums were a key draw; 91.8% of units at these two projects were sold at less than S$1.5 million while 98.1% were sold at less than $2 million. In the CCR, the allure of reputable developers provided the quality assurance that most buyers seek for their prime residential investment. Prices in the CCR were propped up by Boulevard 88 which did well with 26 units sold (74.3% take-up) at a median price of S$3,613 psf. In the EC segment, 8 units were sold, out of which 5 were from Northwave in Woodlands. All eyes will be on the next highly anticipated EC launch at Sumang Walk, which is likely to be launched soon. CBRE believes that after the new home sales spike, developers may slow down launches to give the market a breather to allow inventory to clear from existing launches. “As expected, developers’ sales spiked in March 2019 amid 10 new launches, including two mega projects such as The Florence Residences and Treasure at Tampines. The two projects alone accounted for over a third of the total new private home sales last month. Data released by the Urban Redevelopment Authority on Monday (15 April) showed that developers sold 1,054 new units, excluding Executive Condos (ECs), last month – more than doubled the 455 units sold in February and up 47.2% year-on-year from the 716 units transacted in March 2018. The increase in sales was again supply-led as developers placed 1,812 new units on the market. This was the highest number of units launched since 2,239 units were rolled out by developers in July 2018. Apart from The Florence Residences and Treasure at Tampines which are in the Outside Central Region (OCR), other new projects launched in March included: Boulevard 88 and 35 Gilstead in the Core Central Region (CCR), Nyon, One Meyer, Residence Twenty-Two, Rezi 24 and 1953 in the Rest of Central Region (RCR) and The Essence in the OCR. Together, these new launches contributed to 41.6% of the total developers’ sales last month. New home sales spike happened in March as developers marketed more projects after the Lunar New Year holidays in February. Star performers in March included: Treasure at Tampines which moved 289 units at a median price of SGD1,335 per square foot (psf); The Tre Ver which sold 131 units at a median price of SGD1,602 psf; The Florence Residences which shifted 77 units at a median price of SGD 1,434 psf; and Parc Botannia and Riverfront Residences which each sold 55 units at a median price of SGD1,303 psf and SGD1,334 psf, respectively. March 2019’s overall takeup rate (Number of units sold divided by the number of units launched during the month) of 58% was, however, the lowest since November 2014 (during which 423 was sold out of 863 units launched). Meanwhile, the takeup rate for new launches was 37% and performance across the 10 new launches was mixed. The Florence Residence sold 77 or 39% out of the 200 units launched, and just 5% of the total 1,410 units available. The less-than-ideal launch takeup could be due to the competitive supply situation in the Hougang/ Upper Serangoon area, where a few major projects such as Affinity at Serangoon, Riverfront Residences, The Garden Residences with a total 3,137 available units had been launched since July 2018 and had soaked up pent-up demand. 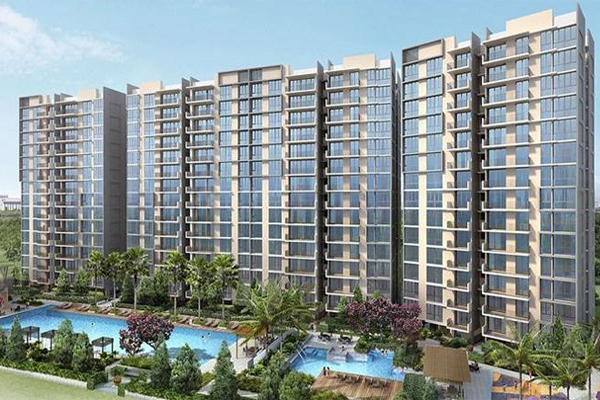 Treasure at Tampines, the largest condo project in Singapore, sold 289 or 59% of the 490 units launched or 13% of the total 2,203 units available. On the other hand, luxury project Boulevard 88 sold 26 or 74% out of 35 units launched, or 17% of the total 154 units available. This is a creditable performance, given the median price achieved of SGD3,613 psf or an average quantum of SGD8.9 million per unit, reflecting the resilient demand for luxury homes, despite the cooling measures. Despite the ample supply of new launches, buyers continued to dip into previously launched projects – in particular, The Tre Ver which sold 131 units in March, higher than the 48 units sold in February. The uptick could be due to potential buyers who were deflected from nearby Park Colonial which is now 72% sold and has started to raise selling prices. We note Park Colonial’s median price has risen to SGD1,828 psf in March 2019, from SGD1,756 psf during its launch in July 2018. Ms Tricia Song, Colliers International’s Head of Research for Singapore, said March’s sales brought total new private home sales for Q1 2019 to 1,946 units – up by 23% from 1,581 units sold in the corresponding period in 2018.
iCompareLoan is the best home loans portal for home-seekers, buyers, investors and real estate agents alike in Singapore. On iCompareLoan, you will be able to find all the latest news and views, informational guides, bank lending rates and property buying trends, and research data and analysis. The post New home sales spike as developers market new projects appeared first on iCompareLoan Resources.